Barb Hutcherson from the Lost Dog and Cat Rescue Foundation offers some advice for keeping your four-legged training partner healthy. Hot and muggy summer weather can be uncomfortable for humans and canines alike. While running with your pets can be a great form of exercise, there are a few things to take into account before heading out the door. 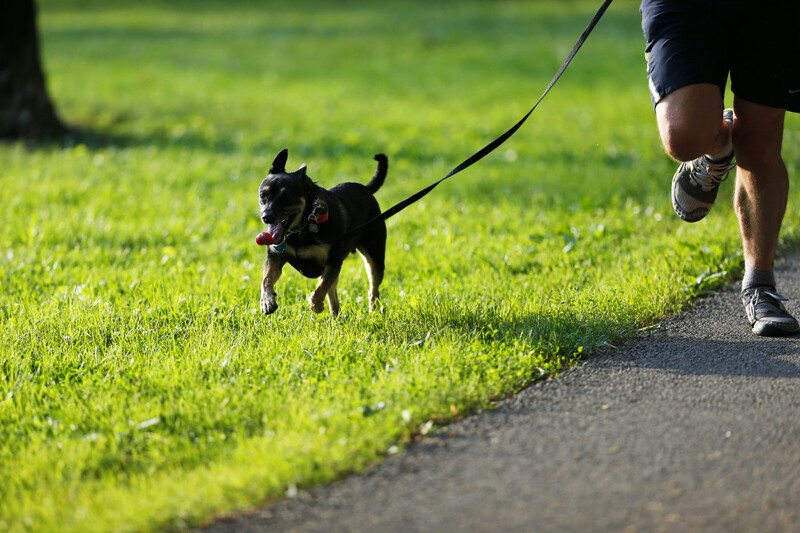 First, discuss any concerns about running with your dog with your veterinarian. He or she is your best source of information on your particular dog’s suitability for running. It is crucial that you are aware of the signs of heat distress and respond quickly if your dog is struggling. If you see any of these signs, or are at all worried about your dog’s condition, slow down, walk and assess the situation. Take water with you and be cognizant of your pet’s demeanor; cooling your dog down with cool water (particularly on the footpads and on the face) is the best way to help him/her cool down. Do not use ice water for cooling or drinking. Ice water can make the situation worse instead of better. We want everyone- human and canine- to have fun and be safe out there, so let’s remember our doggie pals might need some extra attention and caution. Click here for more information about running with dogs.